Today I'm sharing some information for hosting the most darling afternoon tea shower! 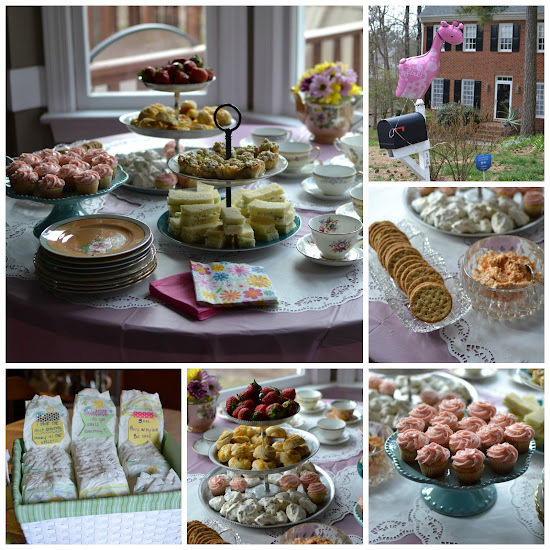 At the beginning of the month another neighbor and I hosted a baby shower for yet another neighbor. We decided to host afternoon tea and enjoy each other's fellowship along with a fun shower activity. All the details are below! We hosted the shower at two o'clock in the afternoon. This allowed us to provide an array of savory and sweet tidbits but not have to worry about anything too heavy. This works perfectly for a tea spread! 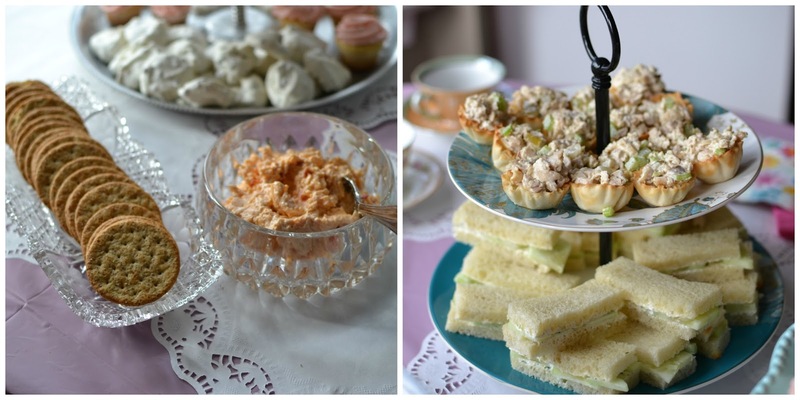 Our savory items included pimento cheese and crackers, chicken salad cups, and cucumber sandwiches. 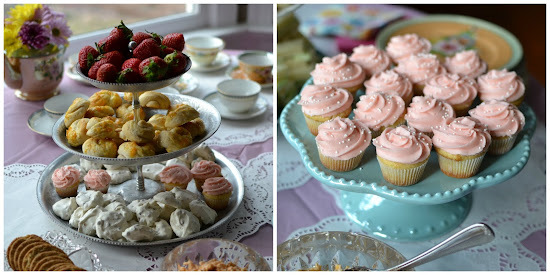 The sweet items included mini vanilla cupcakes, sweet orange knots, meringue cookies, and strawberries. For the pimento cheese and crackers, I served my favorite go-to store brand. It's Palmetto Cheese spread and it's always a winner at parties. Served along with wheat crackers. This pimento cheese is a great shortcut. I was tempted to make my own but I was making everything else and thought this would help me out! For the chicken salad cups, I made chicken salad. My chicken salad of late consists of chicken pulled from a rotisserie chicken and shredded, tossed with diced celery and pickles, a little dijon mustard, salt and pepper, and mayonnaise. I spooned the chicken salad into phyllo cups that I warmed / crisped in our toaster oven according to package directions. I prepped the chicken salad the day before the shower but filled the cups the morning of. For the cucumber sandwiches, I used a white loaf from a local bakery (but honestly think Wonder bread would've been better) and removed the crusts. I peeled and thinly sliced one cucumber. For the spread I mixed equal amounts of mayonnaise and soften cream cheese with electric beaters (probably ended up with about 3/4 cup of the mixture but I added more after initially mixing it together because it didn't look like enough). Once they were incorporated I added freshly chopped dill and salt and pepper. I spread the mixture on each side of the bread before layering the cucumbers and cutting the sandwiches into thirds. The sandwiches were prepared the morning of the shower. For the sweet orange knots, I found these while browsing Pinterest and they were a hit! Here's the recipe. I made these the morning of the shower. Line a baking sheet with parchment paper. Mix granulated sugar and 1 tbsp of orange zest together in a shallow bowl. Bake for 8-10 minutes. Watch carefully so sugar doesn’t burn. While knots are still warm brush them with orange glaze. Let cool for about 2-3 minutes. Serve. Orange Knots may be stored in an airtight container and served the next day. They are best warmed in the microwave for about 10-15 seconds. For the meringue cookies, one of my go-to make ahead cookies you can find the recipe on the blog here. These were prepped the day before the shower. They need to be left in the oven for a few hours (they're made by placing them into a preheated oven and then turning it off) so it's easy to make them right before bed and you'll wake up to these wonderful dessert bites. For the mini vanilla cupcakes, I've started making this recipe this year to replace buying boxed cake mixes! It's tasty and really highlights the vanilla flavor. Here's the recipe and here's the link to the buttercream frosting we recently shared and I've been making it to go along with the homemade cupcakes. The frosting was tinted pink because a baby girl would soon be making her arrival! Heat oven to 350F. Place paper baking cup in each of the muffin cups. Grease and flour muffin cups or spray with baking spray with flour. In a medium bowl, mix flour, baking powder, and salt; set aside. In a large bowl, beat butter with electric mixer on medium speed 30 seconds. Gradually add sugar, about 1/4 cup at a time, beating well after each addition and scraping bowl occasionally. Beat 2 minutes longer. Add eggs, one at a time, beating well after addition. Beat in vanilla. On low speed, alternately add flour mixture, about 1/3 of mixture at a time, and milk, about 1/2 at a time, beating just until blended. Bake 20 to 25 minutes or until golden brown (for cupcakes and 17 to 20 minutes for mini cupcakes) and toothpick inserted in center comes out clean. Cool in pans 5 minutes. Remove cupcakes from pans; place on cooling racks to cool. Frost with desired frosting. Our tea shower obviously featured a variety of tea bags to choose from but also an infused water! This was a great addition to offer to the teas. The water was infused with strawberry, lime, and mint. We had the various tea bags set out in a serving bowl and then a kettle of hot water ready to go. All the teacups were set out on the serving table. Between the other host and myself we had a mix and match assortment of teacups that really set off the shower! What new parent to a newborn doesn't need some diapers?! And diapers with cute messages at that! The other host put everything together for this activity and it turned out really well. She had various cut out shapes to write "Midnight Messages" to the new parents and craft tape to attach to the diapers. The new parents welcomed their baby last week and we wish them all the best as they embark on this new adventure! I can't get over all yall did- wonderful!!!!! !